Workshop "How to successfully apply Condition Monitoring"
Do not only prevent the downtime of your machinery. Also prevent the unnecessary overhauls and save enormous costs. This workshop is a must for every maintenance professional, maintenance manager and service engineer. During this workshop we will show you the steps necessary for the successful introduction and application of a condition monitoring program. You will learn about the technology behind this concept combined with experiences and recommendations from real applications. Different study cases from various industries as metal, paper, chemical, food, marine and offshore will be discussed. On top of this you will learn about the enormous saving which are possible by skipping the standard measures (preventive) and watchfully reacting on signals that indicate the real condition or your machinery (predictive). Check this part of our website for an up-to-date overview of course dates and the application form. Maintenance in general and especially vibration measurements require specialized knowledge that can only be mastered after many years of experience and education. 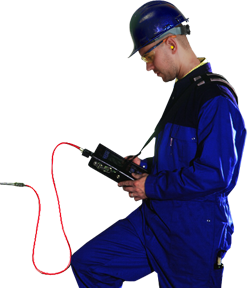 For larger companies with a world-wide field of operation, we offer customised training programs that enables your employees to perform the vibration measurements after which we will perform the data analysis. This approach enables you to monitor your machinery with our help and supervision. In this way we introduced a full 'self supporting condition monitoring program' for a renowned Dutch company. After the customer forwarded their requests and project requirements, Van Geffen VMS offered a complete program including the procurement of the equipment and training of the involved personnel. The customer performs all measurements except once year when the measurement are performed by the engineers of Van Geffen VMS. The data analysis and the management of all the databases are provided by us. The refreshment courses in the following years make sure that everyone involved in the project stays up-to-date with the newest technologies.